Aaron Wallace ended up in Menomonie when he was 20 years old – “for a girl,” he sheepishly told me, “while I was logging with my dad.” Wallace comes from a whole line of loggers – his father, grandfather, and great-grandfather were all lumbermen. So you could say he’s got a natural connection to wood. Things with said girl dissolved, life moved on, time passed, and still Wallace found himself looking to pursue his woodworking passions in the Chippewa Valley, so he tasked himself with building a wood shop on his property in the middle of Menomonie all on his own. This wouldn’t be just any old wood shop; it would be his wood shop. And after a year and a half of solid work with only a router, a circular saw, and a chainsaw – an investment of funds, time, and sweat – the gorgeous shop was finished and Wallace’s company, Oxbow Designs, was born. 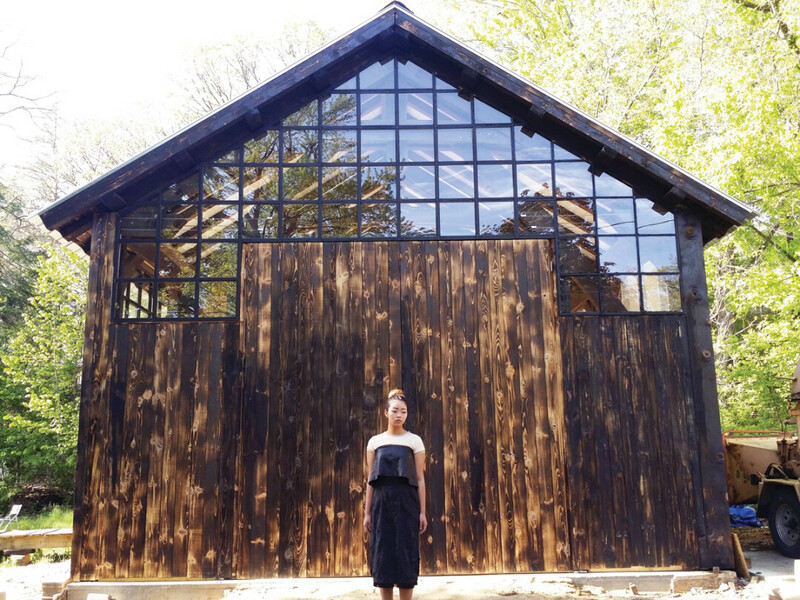 The shop sits in front of a wooded lot next to Wallace’s house, with tall sliding window walls, intricate custom timber framing, and tons of natural light. “I wanted to build something that I want to be in, a place that will inspire me and remind me of what I can do,” he said. 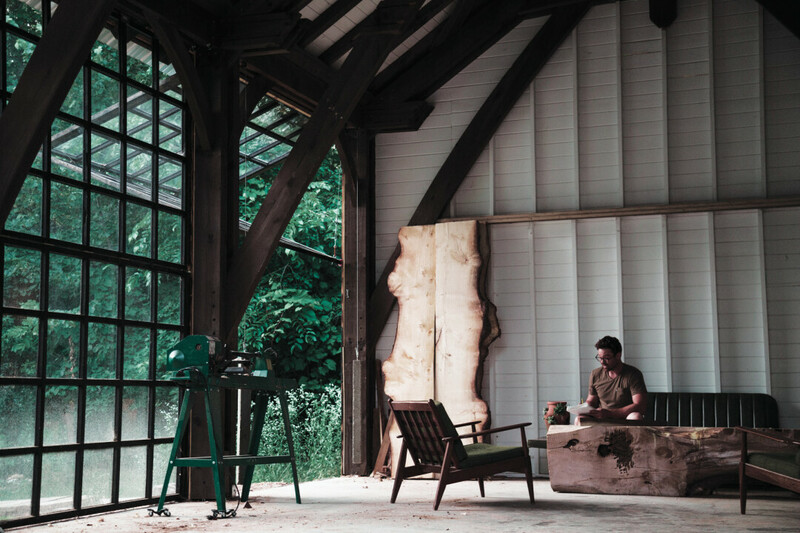 The shop’s completion sparked a slew of big projects as Wallace started building timber frames and furniture while collaborating with tons of other craftspeople and soaking up all the knowledge and know-how he could. Fast-forward to the present, and the young company already has a few high profile projects under its belt. Eaux Claires Music Festival-goers might remember a secret stage off the beaten path in the woods where S. Carey and other artists performed for year two in 2016. That was Oxbow. And now, Wallace, along with his collaborators, just finished work on what is hands down the company’s biggest project to date – a huge, multi-tiered pavilion in the heart of Menomonie for the city’s quickly growing Farmers Market in Wilson Park. 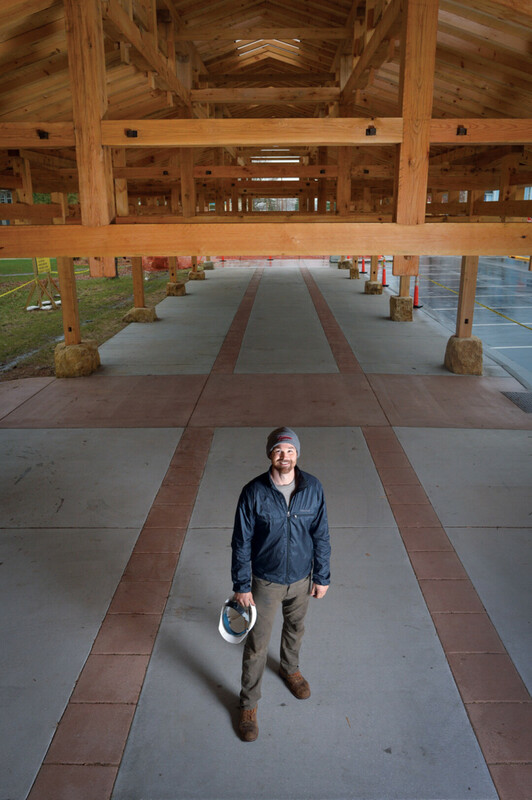 The farmers market pavilion project saw Wallace constructing timber frames for months on end along with Justin Utpadel of Heartland Contractors, Tim Rau of New World Barn Company, and Jay Whitecloud of Tosatoma Designs. The team worked tirelessly – sometimes in the dead of winter out in the cold – to get the timber frame constructed and positioned, and after such a huge project, Wallace said he’s endlessly relieved and proud of the work they did. And working with the Menomonie-based Shackleton Tree Service, Wallace has a amassed a fine-looking surplus of beautiful hunks of local wood, everything from rich walnut trees to enormous maples – the kinda stuff that makes Wallace and his ilk salivate at all the beautiful things yet to be created. Now that the pavilion project is behind him and his stockpile is begging to be made into cool stuff, Wallace wants to take a beat to focus more on custom furniture pieces and more timber framing. 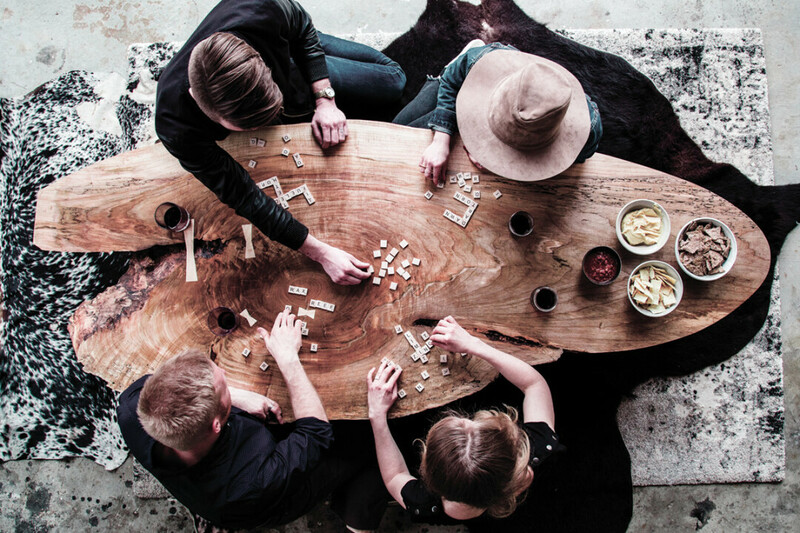 Oxbow is a young undertaking that has a world of opportunity ahead of it. And there’s a lot of wood out there. It just takes the right person to craft it into something beautiful. “I’m blessed to have stumbled onto something that I can’t stop thinking about, and I have to do,” Wallace said. “It definitely feels like I have my purpose even though I’m only scratching the surface. 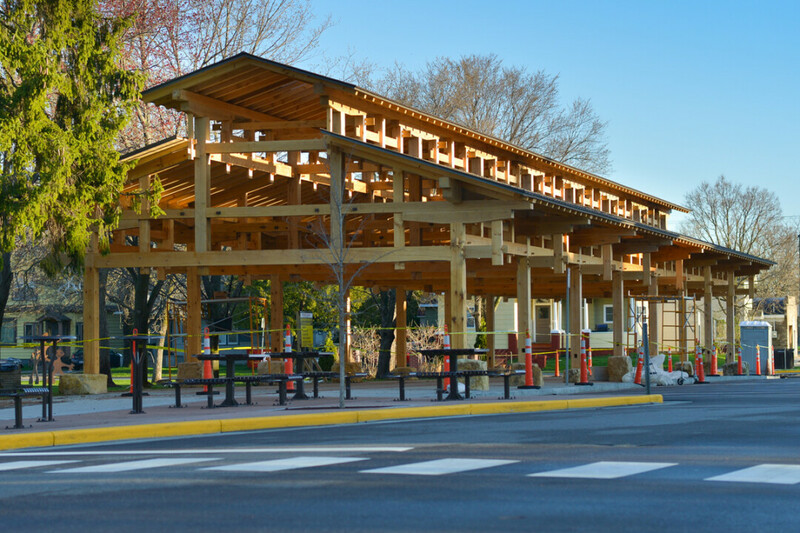 You’ll be able to check out Oxbow Designs’ timber frame pavilion all summer at the Menomonie Farmers Market in Wilson Park starting on May 20. 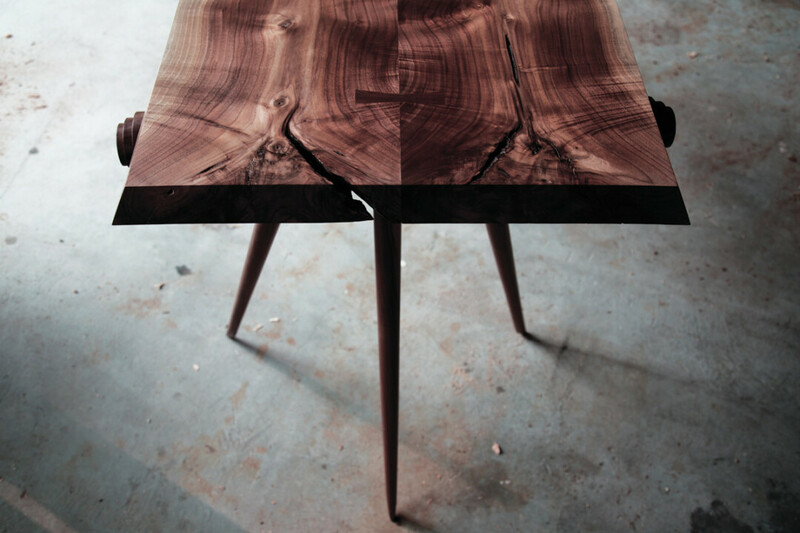 To learn more about Oxbow Designs and take a peak at some of Aaron Wallace’s work, check out www.oxbowdesigns.com.